Almost everyone feels abdominal pain at some point, and most of the time it’s not serious. 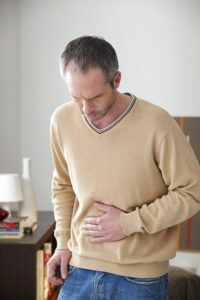 But it’s not easy to tell when it’s time to see a doctor about abdominal pain because your pain level does not always reflect the seriousness of the condition causing the abdominal pain. You might feel severe abdominal pain and cramps if you have a stomach flu, food poisoning, or even gas. But a more serious, life-threatening condition, such as early appendicitis, may only cause mild abdominal pain or no abdominal pain at all. In fact, many different conditions can cause abdominal pain. The key is to know when you need to get immediate medical care, such as at an urgent care center or a hospital emergency room. Sometimes you may only need to call an urgent care center about abdominal pain if the pain is not extreme. A nurse or doctor can tell you more about what steps to take next, including home care, such as sipping water and other clear fluids. People describe abdominal pain in different ways. Sometimes abdominal pain occurs at certain times, such as after meals or at night. All of these details about your abdominal pain provide doctors and medical professionals with important clues about the cause of your abdominal pain. Generalized abdominal pain means that it affects most of your stomach area. This type of pain is more common for viral gastroenteritis, gas or indigestion. More severe generalized abdominal pain might be caused by a serious condition, such as a blockage of the intestines. Localized abdominal pain means that the pain is focused in one part of the stomach area. This type of abdominal pain can sometimes be a sign of a problem with an organ, such as the appendix, gall bladder, or stomach. Cramps can cause severe abdominal pain but most of the time they are not a serious problem. Cramps are often accompanied by diarrhea, gas and bloating. Colicky abdominal pain comes and goes in waves. This type of abdominal pain can start and end suddenly, and it can often feel sharp and severe. Often, this type of pain can be caused by kidney stones or gallstones. Less serious causes of abdominal pain may include constipation or food allergies and intolerance, such as lactose intolerance.